One of the best things about San Diego County is the fact that you can be at the beach, in the mountains, or in the desert pretty much within an hour’s drive from downtown. And once the rainy season rolls around, there’s nothing that locals want to do more than head to the slopes and hit the mountains! We’ve rounded up the best areas near San Diego County to enjoy some snowfall. At just over 6,000 feet above sea level and 55 miles east of downtown San Diego (about a 1-hour drive), this is one of the most popular places to see winter snow! Mt. Laguna is a great spot for adventure-seekers, and you can cross-country ski, sled, or toboggan in several spots throughout the area. The most popular location is close to Mt. Laguna Lodge, where you can also book reasonably priced accommodations for the night if you feel like getting in a bit more snow time. You can also purchase an Adventure Pass here and check out their Visitor Center for more information on current conditions. If there is already snow on the mountain, you might need to outfit your vehicle with chains. Highway Patrol often sets up check points to ensure everyone’s car is outfitted properly, and you may not be allowed to drive up the mountain if they catch you without them. Cuyamaca Rancho State Park turns into a winter wonderland most winters, especially years when we receive a lot of rain. The most popular area is in and around the Paso Picacho campground, although both campgrounds offer several hiking trails to nearby notable peaks (Stonewall Peak, Cuyamaca Peak, and others). Additionally, there are several free turnouts that are perfect for letting the little ones stop and play in the snow (snow angels, anyone?!). If you aren’t looking into snow camping, try nearby Blue Jay Lodge for affordable accommodations. On your way home, be sure to stop in Julian for some hot coffee and warm apple pie! 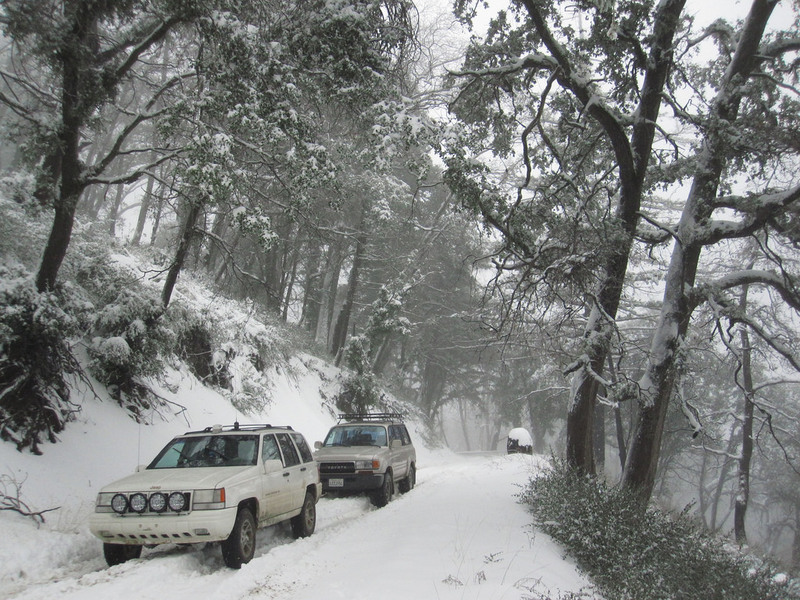 A windy 1 hour, 45-minute drive up Palomar Mountain will transport you into a winder pine wonderland! Cedar, pine, and fir wood forests abound up here, and the rugged terrain is precisely what makes this part of town so special – you definitely feel like you’ve left San Diego County! While Palomar Mountain is farther than other snow destinations in San Diego it’s one of the best in terms of snow hikes and solitude. Double check which hikes require an Adventure Pass before you go; certain longer hikes require them while other, shorter ones do not. If you’re looking to stay the night, there are plenty of camping options nearby as well. Popular hikes include the French Valley Trail and the Weir Trail. 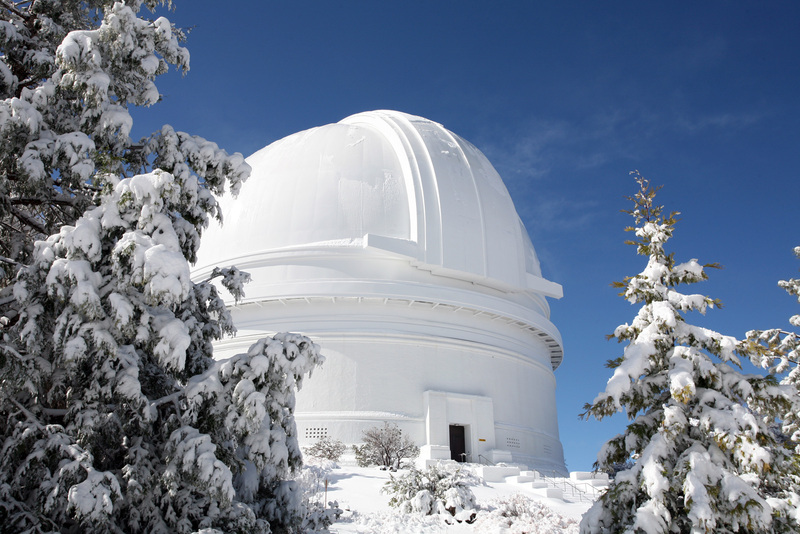 Head to the nearby Palomar Observatory to take in the scenic views and check out the snow-covered observatory while you’re there. Many flock to Julian for the little country town’s famous apple pies and scenic hiking trails, but coming here during the winter is an entirely different experience! At just an hour and fifteen minute drive from San Diego, Julian is one of our favorite places to head on a weekend adventure. Build a snowman, hike along a snowy trail, or simply take in the panoramic views from one of the many lookouts nearby. You’ll find parking at William Heise Park or at Julian Memorial Park, or directly in the downtown area where there are plenty of parking spots. Don’t forget to indulge in some apple pie before you leave! Idyllwild is a beautiful, cozy mountain town that’s just under two hours away from San Diego. Located above the San Jacinto Mountains in Riverside County, the town is known for its quaint downtown lined with cute boutiques, yummy restaurants, and art galleries. The best time to come here for the snow is typically December-February, though it depends on how wet the winter is. Idyllwild is a terrific spot for a winter hike, sledding, or cozying up in a local Airbnb to watch the snow fall from the comfort of the indoors. Make sure to check weather and traffic conditions before heading up to the mountains. Bring chains in case they are required on certain roads. Bring a fully-charged cell phone and plenty of snacks for the road, just in case you’re not the only one with the grand idea! Always pack your trash out, and practice the “leave no trace” philosophy; most of these lands are within National Forests and are protected by law. Where is your favorite place to see the snow in San Diego County?